Messi, who only turned 29 a few days ago and certainly has a couple more productive years ahead in his football career retired from the international scene out of frustration. The frustration of knowing that he let his team down by failing to convert his penalty. 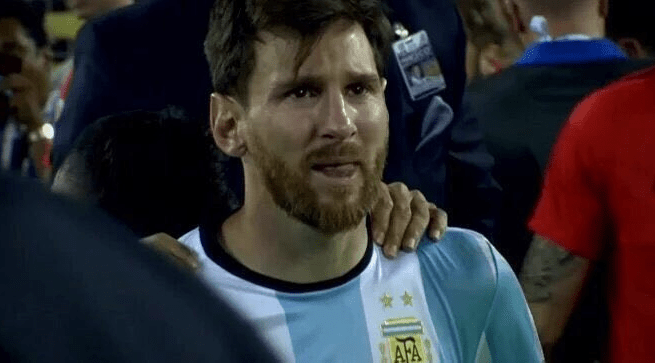 The frustration of having to admit that he fell short of the expectations of over 41 million Argentinians yet again, let alone billions of fans who adore him across the world. The droop in shoulders, that look of regret and eventual tears after the penalty shootout were a poignant sight for anyone who has followed the football maestro’s career which has spanned over a decade. The outcome of the Copa America final between Argentina and eventual winners Chile and the subsequent retirement of Messi got me thinking. Even geniuses cry. The best of the best have moments in time when they have genuine cause to wonder how good they really are. For all his international acclaim, brand endorsements, worldwide following, incredible fan base, numerous individual awards and trophies, broken records and matchless achievements, the Barcelona forward must have looked at himself very differently that fateful Sunday night and wondered if he was actually worthy of all the hype and accolades that have trailed him throughout his illustrious career. And I understand, this was one thing he wanted most at this time in his career. And he fell short. Time and time again he has been close to winning a trophy with his national team. A feat that many insist he must achieve before he can stand shoulder to shoulder with the all-time greats (a notion I disagree with by the way), Maradona and Pele. At the moment, he must feel like the fates are against him or the god of soccer cast a spell on him. Here’s a man who has won it all. Almost. But, chose to take the rash decision of quitting the national team in his prime. It’s the danger of being so good. It’s the danger of being too good. In a world where mediocrity is celebrated everyday people like Messi can hardly be understood. I was discussing his decision to retire from the national team with a friend, and how I empathize with him and believe he could still rescind his decision after giving it further thought. My friend disagreed. He was of the opinion that the Argentinian captain is only being selfish and egotistic in his decision. While I disagree that he is being selfish, I absolutely agree that his ego has been badly bruised, even though I wouldn’t tag that egotism. But frankly, I don’t think anyone should begrudge him for that. It is hard for a genius to accept any form of failure, especially failure in a field where he is arguably adjudged to be the best. Messi has failed to win a trophy with his home country on four different occasions. Apart from the enormous pressure he has been under to deliver with Argentina over the years, it can’t be easy for even the average person to handle failure four times, let alone an individual of exceptional natural abilities. We all remember at least one person in our primary or high school days who genuinely believed they had let themselves down after getting just one question wrong in an examination even though they still had an A+ in it and scored a hundred percent in all other subjects. We all have that one friend or family member who’s very particular about crossing their “T’s” and dotting their “I’s” to perfection. Some of us can never understand it. Forget that. Many of us of will never understand it. We think they are too finicky. We believe “their own is too much.” But these are the ones who stand out from the crowd because their way of thinking and acting is far above and beyond average as they strive for perfection in all they do. The reality is, even if Messi never kicks another ball again, it won’t take anything away from what he has achieved so far, the numerous records he has shattered or the super legendary status he has attained. I am one of those who are unwavering in their belief that the diminutive superstar is the best footballer ever to play the beautiful game or grace any pitch of play. It would take years, decades, heck, even centuries for anyone to break his many mind-blowing records. This retirement decision of his is only borne out of the angst and devastation of a man who’s so good, he can’t help but beat himself up for something that should be the responsibility of a group of people. When a person is that good, it’s especially difficult for them to accept defeat, and successive defeats more often than not tend to take the wind out of their sails. But, if anyone has the ability to bounce back from a setback, it is they. The same spirit that makes them doubt their genius often times also prods them to give it a try one more time. I’d hardly be surprised to see Messi lead the Argentine national team to the 2018 FIFA World Cup in Russia, particularly now that the Argentine president, and football icon, Maradona have urged him to rethink his decision. As a true great, Messi must eventually shrug off his current woes and rise again like the champion that he is. The Michael Jordans and Muhammad Alis of this world faced many challenges throughout their career, but kept focus until they surmounted that which threatened to make a nuisance of their genius. Messi cannot give up now. This piece is a pointer to the fact that humans are human, we are not gods and can’t be God. It will give everyone striving in life the hindsight that; in everything that a man does, it is ‘God that blesses a man without adding sorrow’. I trust God to do what only He can do if Messi can trust Him more and return to his national team. The exploits he has hitherto failed to perform will be done with ease with God on his side. Have always seen him, Messi, celebrate his goals by pointing fingers upwards the sky depicting acknowledging God for the feat. After-all, he is still young, much younger than the age some Nigerians began their football careers. I agree. At the end of the Messi is still a mortal like the rest of us, it’s just that some of us forget that sometimes. Thanks for commenting sir. There is always an element of luck in matters relating to sports especially football and this I think is what Messi needs, a little bit of luck added to his craft will grant him the desired result, I agree with you that he will reconsider his decision to quit international football, failure to do so will amount to quiting at the edge of success, this is not the trait of Successful people!. It’s arguable actually. He has tried four times already, so it’s hard to fault him in that regard. All the same, he has to want it bad enough to keep trying until it’s practically impossible to continue. Thanks a lot Opeyemi. I’m one of those fans who think footballers don’t have to reach “menopause” before announcing retirement! However, I think Lionel’s was almost unexpected and unpredictable. I felt like: “Brotherly, you’re not done yet o!”. As a matter of fact, it has never crossed my mind that Messi or Ronaldo will no longer appear in jerseys in my children’s days. But, beyond Messi and beyond football, I agree with you that geniuses always struggle getting their minds to believe they failed in their field of expertise. In fact, history records those whose expressions of self-disbelief are overstretched and graduate into suicide. I feel Messi’s pain, perhaps not as much as you! It’s the curse of being a genius, they are the ones who always feel they haven’t quite done enough yet even though the vast majority would kill to be able to boast of half of what they have achieved. Thanks Dapo. The teacher’s letter is quite touching. I can imagine that that’s how the many million Argentinians feel too. Thanks Kunle.